I love books. There was a time I thought I'd never write those words. I didn't start reading on a regular basis until my mid-twenties and didn't develop a favourite genre like most folk have until I had turned thirty. I like sci-fi, horror novels are pretty cool, spy books please on regular basis, Steampunk and fantasy are still beyond me on both understanding and appeal but, if there is one section of a book shop you'll always find me in, it's the non fiction wall. Love it. Can't get enough of it. I read military history, crime re-enactment, autobiographical material but my favourite subjects, those I can't do without, involve politics, mainly American and big media. I adore learning about the Internet, whether it's a hacking book or a technical telling of evolution in technology, but it's business and corruption that I'm most drawn to. How Enron got so big and then imploded? Bring it on! How a company of analysts and marketing specialists managed to get involved in 90% of big businesses? Excellent! Then we get to those modern day villains, those guys that can destroy a country in one click of a button, bankrupt a nation before breakfast. Yes I'm talking about Wall Street traders. The problem with these style of books is unless they are about one rogue character, a Bernie Madoff or a Nick Leeson, they tend to make better documentaries than they do films or television shows. It's understandable but still a shame. The books I read are full of facts and dates and tech speak and don't lend themselves easily to adaptation. That is until you read a Michael Lewis book. Lewis has an ability to make a real life account of people and events read like an epic tome, the actual events are often seen as so far fetched they could come across as the figment of a genius mind and Lewis has made this niche his own. The financial journalist has a great insight into any part of the world that involves money. Liars Poker was a great read and is rightly considered one of the definitive books of what Wall Street was like in the 1980's. You have all seen the baseball film starring Brad Pitt and Philip Seymour Hoffman adapted from Lewis' excellent Moneyball: The Art of Winning an Unfair Game. You may also be getting quite excited to see what Christian Bale, Brad Pitt, Ryan Gosling, and Steve Carell do with the boom and bust story surrounding the housing market collapse in The Big Short. It's the latest release by Lewis that enthralled me the most though and the one I hope someday becomes another cinematic project, Flash Boys. The fact I didn't completely flunk my maths exams years ago was probably more due to luck than any knowledge I may have had and so to be reading a book on the complexities of high finance would probably give my old teacher a coronary. However Lewis takes every technical and difficult element and writes in a way that even someone like me can at least understand what's going on, even if part of the story is incomprehensible to me. That part is the main part. Speed. The power of a millisecond. The book starts by describing the $300 million cable network built by Spread Networks, in relative secrecy between Chicago and New Jersey, that could connect the two main cities stock exchanges and allow trading that, I won't bore you with figures, borders on light speed. The network was as straight as possible, went underneath mountains and is honestly to a layman like me something I would expect from a futuristic science fiction book. Why do you need to shave 4 milliseconds off a transaction anyway? Oh right, corruption. Well not necessarily corruption but wherever you can gain an advantage in business someone will find a way of using nefarious means to win. Basics now and whoever used this ultra fast network could front run orders. You'd make a deal at ridiculous prices because you had the speed advantage and then would fulfill your customers orders at the price they'd called you at allowing you to skim a personal percentage off the top. See? Nefarious! For example, suppose a broker receives a market order from a customer to buy a large block—say, 400,000 shares—of some stock, but before placing the order for the customer, the broker buys 20,000 shares of the same stock for his own account at $100 per share, then afterward places the customer's order for 400,000 shares, driving the price up to $102 per share and allowing the broker to immediately sell his shares for, say, $101.75, generating a significant profit of $35,000 in just a short time. This $35,000 is likely to be just a part of the additional cost to the customer's purchase caused by the broker's self-dealing. So now trading becomes darker, less under scrutiny, and allows big banks and their fund traders to make millions in an unfair way. This drives a greed for better technology and more speed and suddenly you have coders and programmers on big bonuses replacing old school traders. 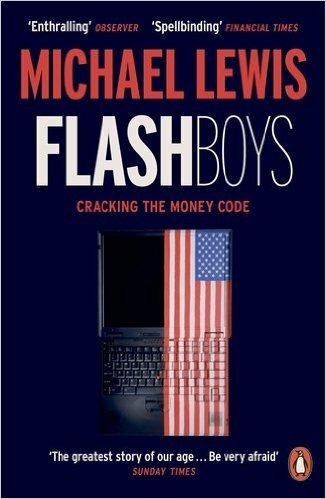 Sergey Aleynikov gets many mentions as he was a programmer for Goldman Sachs accused of stealing the bank's high frequency code, which he wrote, and was later released without charge by the FBI. Many banks and trading firms used this new technology to create dark pools of trading in large blocks of securities away from the exchanges, oversight regulators and investors, allowing trillions to be made. One firm, though, introduced in the book, IEX or the Investors Exchange and its founder Brad Katsuyama, knew what was going on and how and instead of joining the corruption actually tried to do something about it, creating their own exchange on a fairer basis. They created their own server centre and, using their own fibre optic cable and some incredible algorithms, basically froze out anyone trying to create a dark pool on their trades. Their exchange is in essence a dark pool arrangement but with the lights switched on. Players on both sides of the trade have the pricing and information at the very same time and all that IEX do is transparent and public. Seriously, there are traders doing things nicely and fair to all. It's nearly enough to shed a tear. Lewis has opened not just my eyes to the wrongdoing in high finance but the government's and the regulator's eyes as well. Whether IEX become a huge recognised exchange is yet to be determined but people now have a choice and wrongdoers are facing prison. Those of us who thought these things could never change now know they can and are more careful with our money. It also highlights the extraordinary power that programmers and technology now have in our world and it's a little overwhelming and a tad frightening if I'm honest. Brilliant book, eye opening revelations and a certainty for Hollywood.